However, some people claim that artificial sweeteners aren’t as “metabolically inert” as previously thought. For example, it’s been claimed that they can raise blood sugar and insulin levels. Artificial sweeteners give things a sweet taste, without any added calories (1). Therefore, they’re often added to foods that are then marketed as “health foods” or diet products. They’re found everywhere, from diet soft drinks and desserts, to microwave meals and cakes. You’ll even find them in non-food items, such as chewing gum and toothpaste. We have tightly controlled mechanisms to keep our blood sugar levels stable (2, 3, 4). There are theories on how artificial sweeteners may interfere with this process (5). Artificial sweeteners won’t raise your blood sugar levels in the short-term. So, a can of diet coke, for example, won’t cause a rise in blood sugar. Mice, when fed artificial sweeteners for 11 weeks, had negative changes in their gut bacteria that caused increased blood sugar levels (6). However, these results haven’t been tested or replicated in humans. There is only one observational study in humans that has suggested a link between aspartame and changes to gut bacteria (7). The long-term effects of artificial sweeteners in humans are therefore unknown (8). It is theoretically possible that artificial sweeteners can raise blood sugar levels by negatively affecting gut bacteria, but it hasn’t been tested. 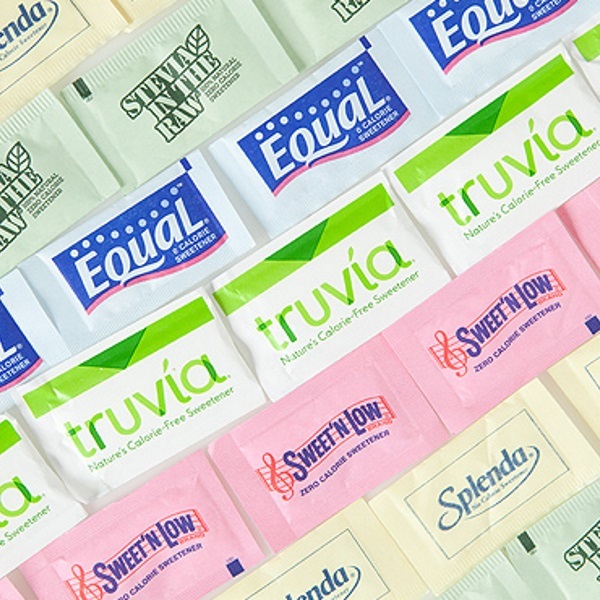 Bottom Line: In the short-term, artificial sweeteners won’t raise blood sugar levels. However, the long-term effects in humans are unknown. In one study, 17 people were given either sucralose or water and then administered a glucose tolerance test (9). However, results are mixed and other human studies have shown no effect (10). However, studies have not linked aspartame with raised insulin levels (11, 12). One study found that mouth washing with a saccharin solution (without swallowing) caused insulin levels to rise (13). Other studies have found no effects (14, 15). Acesulfame potassium (acesulfame-K) can increase insulin levels in rats (16, 17). One study in rats looked at how injecting large amounts of acesulfame-K affected insulin levels. They found a massive increase of 114-210% (16). For now, no high-quality human trials exist, so we don’t definitively know their effects on insulin. In the short-term, artificial sweeteners won’t raise your blood sugar levels, unlike high intakes of sugar. They are considered safe for diabetics (14, 18, 19, 20, 21, 22). Although artificial sweeteners may not be “healthy,” they are at the very least significantly “less bad” than refined sugar. However, if you’re concerned, then you can use other natural sweeteners instead or just remove sweeteners altogether.